I respectfully disagree about the pocket square always having to be white. But, you should own at least one! It is obvious I will be touching upon an accessory, in my humble opinion, every man should use to its full advantage-the pocket square. The pocket square’s origins can be traced back to Egypt, the Greeks and the Romans. Most notably, King Richard II of England was the first to use the pocket square as we (should) do in modern times. A pocket square can make your ensemble go from nice to wow. When one has taken the steps to have to have a solid foundation, look to accessories. What is indispensable to creating your own style is incorporating your individualism. Personally, when it comes to my pocket squares, I adore lots of color as well as floral patterns. I know it comes from my Korean heritage. 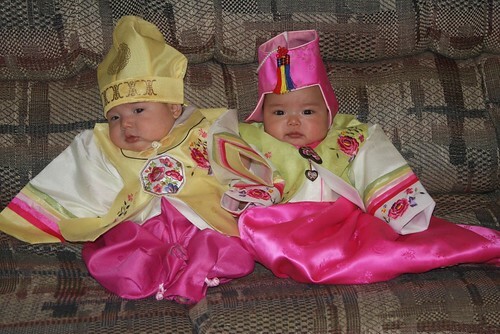 I often wonder how I was dressed for my 100 day celebration, baek-il. Once again, I digress. Pocket squares come in cotton, seersucker, silk as well as polyester blends. When shopping for pocket squares, keep in mind the color palette of your wardrobe as far as dress shirts, causal shirts, t-shirts, and ties. Depending on the material of your blazer, sport coat or suit jacket, this will determine the pocket square material. In addition, the formality of the event will dictate the style you integrate as well as the fold of the pocket square you will use. Another consideration to add is this: when wearing a tie, never match the pocket square. There are pocket square/tie sets that can be purchased everywhere. Avoid them like negative thoughts. This isn’t something one has to acquiesce halfheartedly to. You just don’t do it. For example, if your tie has some highlights of blue contained within its respective pattern, use a pocket square that has a shade of blue that is not similar. It also, may or may not incorporate a subtle/not so subtle pattern. Again, be cognizant the color wheel comes into play for your entire outfit. Now, when one is not wearing a tie, match the shirt whether it is a dress shirt, a casual shirt or a t-shirt. A pocket square transformed me from bouncer to casual gent in roughly 5 seconds. As far as where to purchase pocket squares, I wholeheartedly advise Ebay. If you have been reading along, you are aware I have an online crush on it. I have been fortunate enough to find not one, but two vendors I recommend. The featured pic spotlights pocket squares from The SquarExtraordinaire. They frequently run specials and are quick with their deliveries. Those are just some of the pocket squares I have purchased from their store. I have paid roughly $4.50-$6.00 per square. They are of great quality. They have assortment of styles to choose from. The second vendor I found recently as of December. Feather And Smith make their own reversible pocket squares. The second pic features 4 of their pocket squares I purchased. They sell for $8.95 per square. They ship quickly and are of great quality too. I liked the style and the versatility of their pocket squares. Having a pattern on both sides makes for a definitive conversation piece. Although I am certain those of a conservative style will roll their collective eyes at them. But who cares? You shouldn’t. Remember, once you are fundamentally sound, you will be able to evolve your own style. At the end of the day, this is what you desire. A look and a feel you are most comfortable with, confident with, and secure with. You’re poor, broke and handsome not rich, prosperous and handsome. At least for the interim. Of course, this goes without saying, if you can get your hands on some high end pocket squares for a good price, do it! You can find these gems on . . . wait for it . . . Ebay!. I currently am bidding on a Tom Ford silk pocket square under $50. It is second hand and if one takes a gander at Tom Ford.com, they sell brand new $165-$175. As mentioned in a previous post, second hand stores and the like aren’t anything to turn your nose up at. Locate them in your city and go spend some time there. What are you waiting for? Sae Hae Bok Manee Badusaeyo!